Show horses are equines used within the framework of shows for entertainment. These can be of different breeds and morphologies and, like true entertainment professionals, are used to music, stage lighting and of course the reactions of the public. Both riding and on foot, the equestrian showman needs to work on a daily basis with the horse in order to establish a relationship based on trust. Equestrian shows were originally drawn from the movements in military equestrian combat. Under the influence of Italian princely courts of the renaissance, French equestrians started to teach new riding techniques, introducing dance and music in the horse ballets. In 16th and 17th centuries, equestrian art was tied to the aristocracy. The riding school in Versailles where young noblemen were trained to become officers stood out for the quality of the equestrian education taught by great horsemen. The invention of cavalry charges, in the second half of the 18th century, transformed the use of horses, and the finer points of dressage were cast aside, to be replaced by a more utilitarian type of horsemanship. In the 18th century, British equestrian Philip Astley created the “circus” ring for riding in a circle. The concept was imported to France in 1774 and revolutionized the traditional rules of horse-riding and horse-showing. It is from the meeting in 1778 of Philip Astley with Italian equestrian Antonio Franconi, whose ambition was to bring together horsemen and entertainers, that the modern circus was created. In 1807, Antonio Franconi and his sons opened the Cirque Olympique equestrian theater which had a stage attached to the ring. The use of horses shaped the French circus world of the first half of the 19th century with historical and military pantomimes as well as melodrama. The great French riding master François Baucher presented his exquisitely trained best horses at the Cirque des Champs Elysées (1838-1848). These won over the Parisian audiences by their precise movements and figures. Following the Napoleonic Wars, during which the French cavalry was decimated, military equitation was reconstructed in Saumur which became known as the the Royal Cavalry School from 1825. Jean-Baptiste Cordier introduced airs above the ground as well as work in between pillars. The airs above the ground prepared the horsemen for the heavy shocks of riding in battle. To this day, the Cadre Noir is world-renowned for its airs above the ground. Since 2011, France has gained international recognition, with “Equitation in the French Tradition” being included in the UNESCO list of the Intangible Cultural Heritage of Humanity. Up until the beginning of the Second World War, shows with horses gradually became rarer in circuses, and were replaced with shows featuring exotic animals as well as trapeze performances. In 1974, Sylvia Monfort and Alexis Grüss brought horses back to center stage with their old-fashioned circus. This was based heavily on 19th century presentation rules that were heavily anchored in their era (costumes, lighting, etc.). This became the forerunner of a new type of a circus art that revived old-fashioned approaches through new companies such as Théatre Zingaro, Théatre du Centaure, Cirque Bidon etc.. Heavy horses are well-represented in today’s equestrian show world. Depending on their abilities, they can be found in various segments of the show world, including horses at liberty, haute école classical dressage, horse-vaulting, and working equitation. The equestrian artist uses only voice and whip, standing in the arena and leading the horses through choreographed paces. This is highly precise work that requires a great deal of training for each horse to know and implement instructions. Equestrian acrobats perform trick riding, stunts, human pyramids and the like. 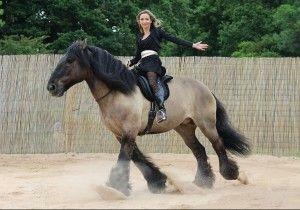 It includes classical vaulting, Cossack vaulting and Roman riding. The horse and rider combination goes through the classical movements of academic equitation: piaffe, half-pass, passage, canter changes, pirouette, Spanish walk, levade, croupade etc. Haute Ecole can also be done on foot, using long reins. Work equitation is derived from the traditional use of horses for driving cattle and in every day tasks.